How does mast rake work? This is a subject to spend some time on and make your rig set up the best. This is an article I found in the December Issue of Sail Magazine, and it’s a good one. This article was written by Andy Horton. Think of mast rake as the distance between the tip of a mast and a vertical axis. You can get an idea of your mast s rake by looking at your boat from a distance. Imagine what a vertical mast, perpendicular to the deck, would look like. Use a reference in the fore-ground or background a tree, flagpole, building, any¬thing vertical for accuracy. Line up your vertical refer¬ence with the mast at deck level. Now, look at how far the mast rip is from the vertical line. The distance between the two tells you how much your mast is raked. Mast rake varies from boat to boat. There is no magic number for how much to rake a mast, but getting it right will help balance your boat The basic rules are: Forward rake adds lee helm; aft rake adds weather helm. I place boats in two general categories boats with static rake (or straight headstays) in all conditions, and boats with dynamic rake, which sail with a sagging headstay in low windspeeds. 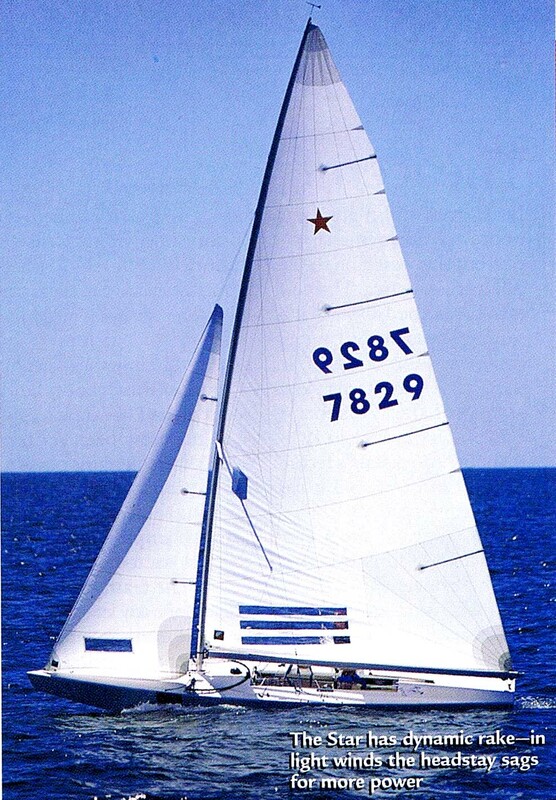 Dinghies that sail with tight headstay/rig tension, including the 420, Vanguard 15, 470, 505, and 49er, are examples of static rake. Most keelboats J/22, J/24, Soling, Mumm 30, ID 35, and Farr 40, for example are tuned to have head-stay sag in low windspeeds. Finding the optimal rake for your boat involves a little trial and error. Base your mast tuning around light-air settings. In low windspeeds you want the mast to be as vertical as possible (minimal rake) and the boat nearly level as you sail upwind. You also want just enough weather helm to steer comfortably. In this configuration the upwind sailplan generates maximum power, and downwind the spinnaker is set as far from the main as possible. Then, as windspeed increases, add rake (drop the mast farther aft) to balance the sailplan. This will also increase weather helm. Static rake. As the wind-speed increases, the rake will stay the same because the headstay is always straight. In windier conditions the boat might feel overpowered and sometimes will be affected by lee helm. To properly tune the rig, add rake by lengthening the headstay. The shrouds may have to be tightened to maintain rig tension. Dynamic rake. Conversely, the mast rake on a boat with a sagging headstay actually increases with building wind-speed. The mast tip is pulled aft, until the forestay is tight, as you pull on the mainsheet, permanent backstay, and running backstay. This often adds too much rake more headstay sag in light air leads to more rake when it is breezy so in this case shorten the head-stay. This may sound counterintuitive, but shortening the headstay will help you get the correct amount of helm. How much rake is too much? Because you add helm with rake, you may have too much rake if it is hard to bear away for waves or if you are more comfortable steering when the main is under-trimmed. 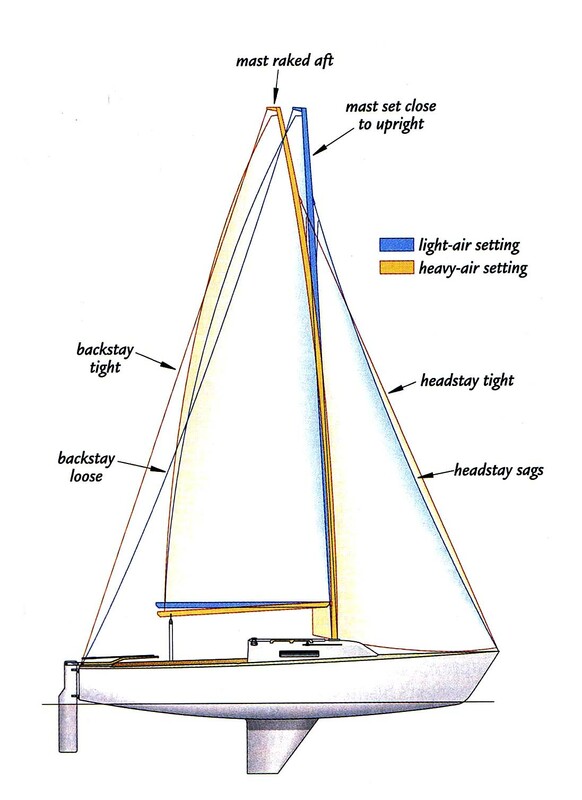 If the boat is easier to steer when it is heeled more than a few degrees, if you find yourself over trimming the mainsheet to develop helm, or if the boat wants to bear away when a puff hits, your mast may not have enough rake. For more information about Mast Rake and how it effects your sailing, go to John Ellsworth’s article. Andy Horton, pro-sailor and US Sailing Team Star sailor who enjoys snowboarding & is an all around outdoor enthusiast. Andy began sailing on Lake Champlain in Vermont where he grew up. He went to prep school at Tabor Academy in Marion MA. After Tabor he attended Hobart college where he studied biology and economics. In 1998 he graduated from Hobart as a 3 time All American. After college he has continued to competitively race sail boats. He has competed in everything from the Americas Cup to Bermuda Races and one design regattas. Check out this video of Andy at the helm of a Star Class Boat. Sailor Profile – Andy Horton from Amory Ross on Vimeo. For more on the Bonneville School of Sailing and their plans for restoring several Star Class Boats, check it out here. Also see our own video about the Star Class Restoration here.